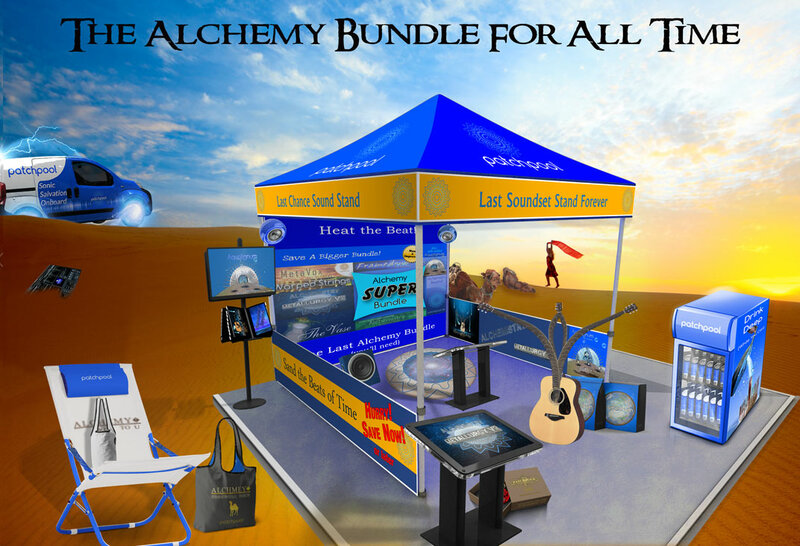 This Sound Bank for Alchemy comprises a whole universe of unique and fascinating sounds. A violinist and a female vocalist were hired to record unique source material using top notch Neumann microphones, all samples were recorded in L-C-R in 48 Khz/24 Bit/stereo, many of those were processed with an array of FX-Plug-Ins to create unheard electronic textures. Multisampled violin and vocal patches featuring conventional and unusal articulations create evocative, cinematic, dark and touching atmospheres as well as beautiful pad sounds. Various chromatic and achromatic percussion instruments as well as metal and glass objects were multisampled, piano strings treated with coins and lots of processed field recordings from around the globe recorded on trips during the last months are included in the 3.71 Gigabyte sample content. Otherworldly electronic textures using mutlisampled software synths with sounds I made for this Bank and fascinating textures created with the incredible Metasynth are another important ingredient of Alchemistry Beyond. Quite a few patches have 4 alternations (Round Robin) for more realism and expressiveness, some also use up to 3 velocity layers. For Alchemy version 1.50 which was released in Septembre 2012 all presets were tagged so that ths user can browse the presets from this set using keywords and categories. You can read/download the pdf-file with further instructions, more details, the licence agreement and a patchlist here. This Bank contains 128 patches with 8 variations each in Alchemy's Remix Pad. All 8 Performance Controllers as well as both x/y-pads are assigned for each patch. All the patches from this Bank are also available as Kore-files (ksds) and the Controller assignment and Remix-Pad Snapshots are available in Kore. NOTE: This Sound Bank requires the full version of Alchemy. It does not work with the Alchemy player version. 'Alchemistry Beyond' is quite simply a magical set of sounds. Once again, Simon Stockhausen has created evolving, morphing timbres that are a warm, organic and, (most importantly), very usable in a mix. 'Violin 4 Bows' has to be up there with my top 10 patches of all time and there are many other excellent ones as well. With its intuitive GUI and huge breadth and depth, Camel Audio's Alchemy has rapidly risen to number one on my list of favourite VSTs and this sound set takes advantage of its strengths with great attention to detail – just automate those X/ Y pads for starters!